I’ve always enjoyed red squirrels, but my special relationship with Ozzy has deepened my love for the species. Life is hard for young squirrels, and less than 25% survive to maturity (American red squirrels are considered sexually mature at age one, and have a life expectancy of 3-8 years in the wild). You may be surprised to learn that —although they have many predators; including hawks, owls, fishers, weasel, coyote, fox and both wild and domestic cats— most young squirrels die of starvation during the long winter months. Many bird lovers and gardeners resent these hungry rodents, but squirrels will always be welcome both in my garden and at my feeders. After all, this woodland belonged to them first. 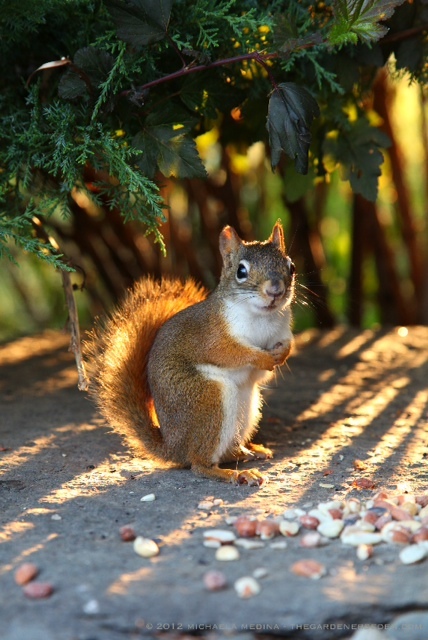 Did you know that red squirrels play an important role in the forest eco-system as seed dispersers and tree planters? Read more about this intelligent, humorous and endlessly fascinating animal by clicking here. You are currently viewing the archives for Sunday, July 15th, 2012 at The Gardener's Eden.